EUR is under pressure because of the situation in Spain and today no important economic reports will be published in Eurozone or the US. The support rests at 1.17480 with resistance at 1.17760 which both lines are below the weekly pivot point at 1.17880. The EMA of 10 is moving with bearish bias in the horizontal channel and it is below the EMA of 200 and above the EMA of 100. The RSI is moving below the 50 level, the Stochastic is showing downward momentum and the MACD indicator is in neutral territory. The ADX is showing sell signals. 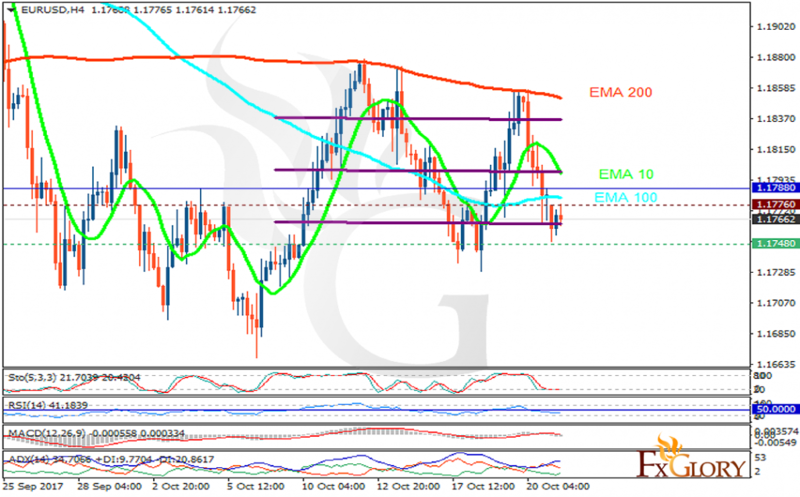 The support level seems to be too strong to be broken therefore EURUSD will start its correction pattern towards 1.1850.